Cleveland police officer David Manns (pictured left, wearing arrogant smirk & black shirt in court) was arrested Friday after he was accused of slamming a woman’s head in a car bumper, a warrant for his arrest states. 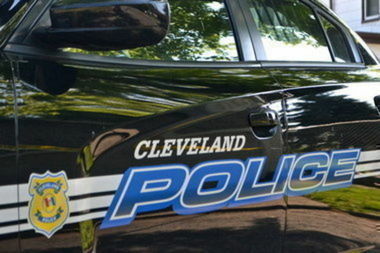 CLEVELAND, Ohio — A Cleveland police officer was suspended Friday after he was accused of assaulting a woman and slamming her head into a car bumper, according to a Cleveland Municipal Court charging document. David Manns, 33, was arrested on a felonious assault charge Friday afternoon. He is suspended without pay until the criminal case is resolved, Cleveland police spokeswoman Sgt. Jennifer Ciaccia said. A Cleveland police officer was arrested after he was accused of assaulting a woman. Officers responded about 4:50 a.m. Friday to the area of West 45th Street and Detroit Avenue, the charging document states. The female victim told police Manns grabbed her and “smashed her head on the bumper” of a car, the document says. The woman received five stitches above her eye, and her shoulder was separated, according to the document. The victim was treated at the hospital, where investigators saw her injuries and took her statement, the document states. The warrant does not indicate whether the woman knows Manns.